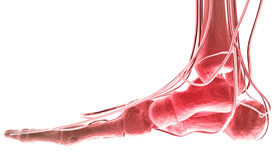 Plantar fasciitis is one of the most common orthopedic conditions relating to the foot. It is when the thick tissue on the bottom of the foot (the plantar fascia) becomes inflamed and irritated, making it difficult to walk. This is most often the result of repeated episodes of minor but recurring injury, such as with frequent running or long periods of standing. The pain can be located in the heel area of the foot or in the arch. It is often worse in the morning due to stiffness of the tissue, and also becomes worse after long periods of walking. The pain often decreases with rest. Your podiatrist will exam your foot for swelling, redness and tenderness of the area. X-rays may be taken. Initial treatment usually involves heel stretching exercises, night splints or shoe inserts. Anti-inflammatory medications may also be given. Treatment can span several months to two years before symptoms improve. Most patients will see an improvement within one year. Further treatment may include steroid injections into the sole of the foot, or in certain situations a surgical procedure that releases the plantar fascia. Foot pain can continue, and progress into a severe condition that affects the ability to walk. Eventually, permanent damage to the plantar fascia or surrounding nerves may occur.